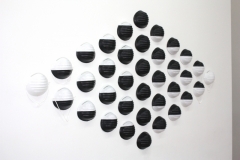 Auxiliary Projects is proud to present a solo exhibition of sculpture and audio work by Bushwick artist Arielle Falk. “Breathe in, Breathe in” will open on June 14 and run through July 14. There will be an opening reception for the artist on Friday, June 14th, from 7-9pm. Falk, a multidisciplinary conceptual artist, has created a series of elegantly concise works exploring her relationship to objects as both a producer and a consumer. In Falk’s schema, we feel continual pressure to bring new products into our lives to let in new potential, a “breath of fresh air.” Too often, however, this process is ultimately unfulfilling: our desires lead us astray and what looked on the store shelf like it would change our life brings us no actual pleasure, no relief. 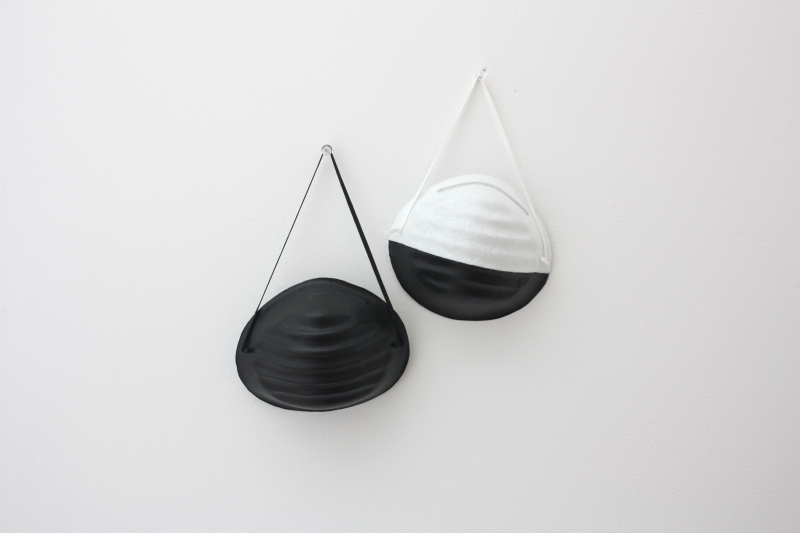 To characterize this longing, which Falk metaphorically envisions as the unkept promise of fresh breath or oxygen upon purchase, Falk has created a series of works evoking a lack of breathable air. 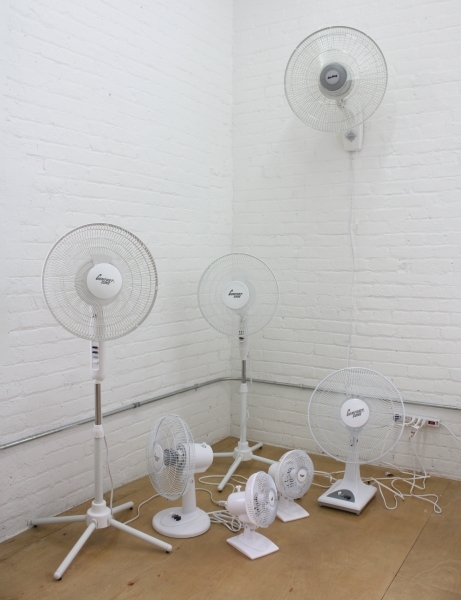 Falk’s oscillating fan sculptures, titled after confident brand names like “Comfort Zone,” subvert the hopes and expectations of visitors walking into the gallery from the hot, stagnant summer air. 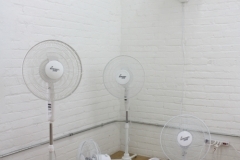 By cutting out the blades from the fans, Falk renders them useless and their promise of the pleasure of a cool breeze false. 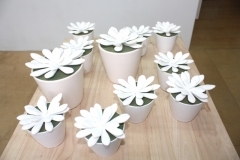 Her “Crassulas” are potted models of succulent plants she has designed and 3D-printed in white plastic. The result, an ersatz plant created by technology, nullifies the air-purifying qualities of the organic original. “MEZ Safety Works” are standard construction dust masks Falk has dipped in a synthetic rubber that gives off toxic fumes when in its initial liquid state. 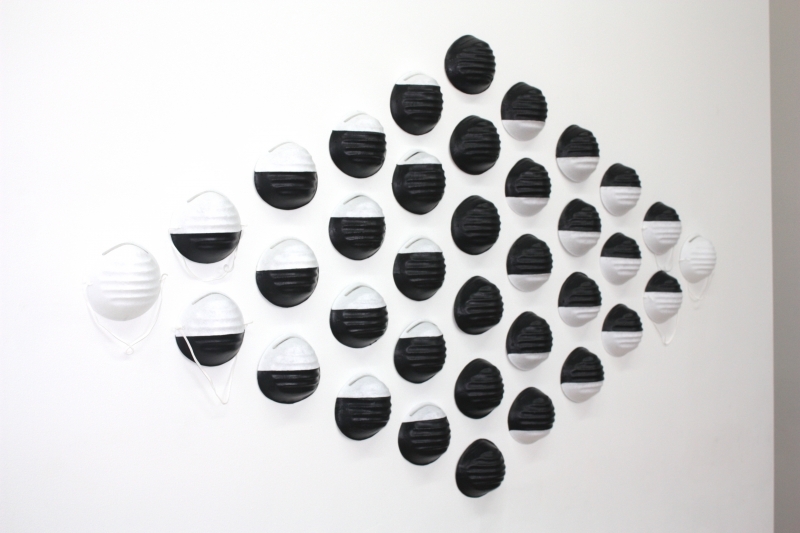 All these works directly reference suffocation and pollution and defy the object’s intended purpose. Falk not only positions fresh air as unattainable to her viewers, but also physically reworks the objects themselves as breathless. Given the industrial Bushwick location of the gallery, as well as Falk’s nearby home and studio, “Breathe In, Breathe In” nods to everyday items one might purchase to improve the quality of the air around us, objects particularly relevant to this specific urban factory-filled landscape. But like the impulse to buy new things to assuage our anxieties and satisfy our longings, Falk’s objects do not provide the comfort they advertise. All this takes place at Auxiliary Projects, a commercial gallery specifically conceived to promote and make more accessible the sale of objects by offering editions of affordable art. Falk works within the context of the space to playfully assert that though consumption is as second nature to us as breathing, we would perhaps be better off if we bought nothing at all. Except her sculptures of course.